Momentum of a body is defined as the amount of motion contained in a body. (a) mass of the body. (b) velocity of the body. Momentum of a body is equal to the product of its mass and velocity. 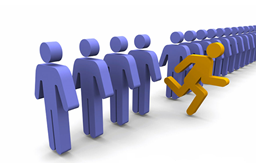 Momentum is a vector quantity and possesses the direction of velocity. 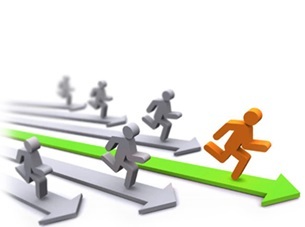 Momentum can be put into following two categories. Thus, momentum of a body is a linear function of its velocity. Thus, relativistic momentum is not a linear function of v.
The rate of change of momentum of a body is proportional to the resultant external force acting on the body and is the direction of that force. Newton’s second law provides a quantitative definition of the force. Here ‘k’ is the constant of proportionality. Mass ‘m’ of a body is considered to be a constant quantity. 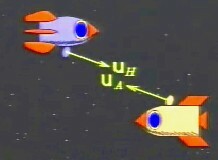 The units of force are also selected that ‘k’ becomes one. i.e., F = 1, m = 1 and a = 1. Consider a system of n particles with masses m1,m2 etc. Each with its own velocity, and linear momentum. 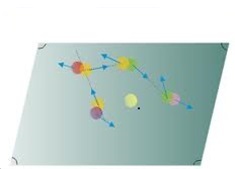 The particle may interact with each other, and external forces may act on them as well. The system as a whole has a total linear momentum P, which is defined to be the vector sum of the individual particle linear momenta. Which gives us another way to define the linear momentum of a system of particles. The linear momentum of a system of particles is equal to the product of the total mass M of the system and the velocity of the center of mass. Table below displays the important relations that we have derived for single particles and for systems of particles. A 4.88-kg object with a speed of 31.4 m/s strikes a steel plate at an angle of 42.0º and rebounds at the same speed and angle (Below Figure). What is the change (magnitude and direction) of the linear momentum of the object? Momentum of the object (p) is defined as the mass of the object (m) time’s velocity of the object (v). The below figure shows a 4.88-kg object with a speed of 31.4 m/s strikes a steel plate at an angle of 42.0° and rebounds at the same speed with same angle which is shown geometrically. The initial momentum of the object is pi when it strikes the steel plate. From the above observation we conclude that, the change of the linear momentum of the object will be, 205 kg. m/s and also from the figure the direction of change of the linear momentum of the object is perpendicular to the steel plate. A 2000-kg truck travelling north at 40.0 km/h turns east and accelerates to 50.0 km/h. What is the magnitude and direction of the cahnge of the truck’s momentum? Momentum of the body p is equal to the mass of the body m times velocity of the body v.
From the above observation we conclude that, the magnitude of the change of the truck’s momentum will be 1.28 ×105 kg.km/h and the direction will be 38.7 ° (south of east). The block in below figure slides without friction. 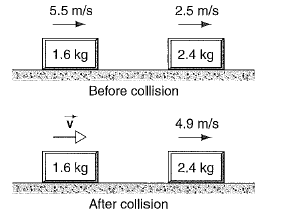 what is the velocity v of the 1.6-kg block after the collision? In accordance to the principle of conservation of energy, the final momentum of the system is equal to the initial momentum of the system. Consider the initial momentum of the block 1 is pi,1, initial momentum of the block 2 is pi,2, final momentum of the block 1 is pf,1 and final momentum of the block 2 is pf,2. So applying conservation of momentum to this system, the sum of the initial momentum of the block 1 and block 2 will be equal to the sum of the final momentum of the block 1 and block 2. From the above observation we conclude that, the velocity v of the 1.6-kg block after the collision (v1,f) would be 1.9 m/s. A golfer hits a golf ball, imparting to it an initial velocity of magnitude 52.2 m/s directed 30º above the horizontal. Assuming that the mass of the ball is 46.0 g and the club and ball are in contact for 1.20 ms, find (a) the impulse imparted to the ball, (b) the impulse imparted to the club, and (c) the average force exerted on the ball by the club. The impulse of the net force J acting on a particle during a given time interval is equal to the change in momentum Δp of the particle during that interval. Here pf is the final momentum and pi is the initial momentum of the body. Force (F) is equal to the rate of change of momentum (Δp) body. As the final speed of the ball is zero, thus the final momentum pf of the ball will be zero. Therefore the impulse J imparted to the ball would be 2.4 N.s. b) The impulse J imparted to the club is just opposite that imparted to the ball. Therefore the impulse J imparted to the club will be 2.4 N.s. From the above observation we conclude that, the average force F exerted on the ball by the club would be 2000 N.
Click here for the Detailed Syllabus of IIT JEE Physics. Look into the Sample Papers of Previous Years to get a hint of the kinds of questions asked in the exam. You can get the knowledge of Useful Books of Physics.